We are now closed for major re-development. The Institute is at the beginning of a major redevelopment process. See under “News” for the latest position. Our brochure is also available online here. NEIMME Lectures will still take place whilst we are out of the building and full details can be found here. The Mining Institute owns one of the finest buildings in Newcastle, Neville Hall, a Victorian building built at the time when high-Gothic architecture was coming into fashion. The outside of the building is known to hundreds of thousands of people, it is next to the Central Station, but few people realise what is inside. 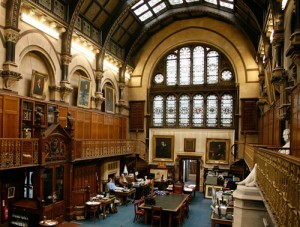 Neville Hall houses the memorial to the Institute’s first President, Nicholas Wood, an outstanding Victorian Library resplendent filled with superb stonework, redolent with exquisite carved stone, wood and paintings with a beautifully decorated ceiling, a vast glass roof and filled with furniture designed for the library in 1872. Below the Library is the Edwardian Lecture Theatre, modeled on the Royal Institution in London and constructed in deep red Cuban Mahogany. What lies within the walls is centuries of history relating to the Great North Coalfield, full of tales of engineering excellence, man’s efforts to wrest resources from the earth’s crust and the perils that brought. The Library is of importance globally, the finest and largest coal mining library in the world and perhaps the best place to study the early Industrial Revolution which began with the use of coal as a fuel in the Great Northern Coalfield 600 years ago. You’ll find lots of information on this website and we’ll be adding loads more information over the next few months including learning resources, loads more information about events, details of how you can help us by volunteering, sponsoring the restoration of some of our valuable and rare books or learning about our rich history. Please read through these pages, but if you can’t find what you seek, then please ring or call in and see us!